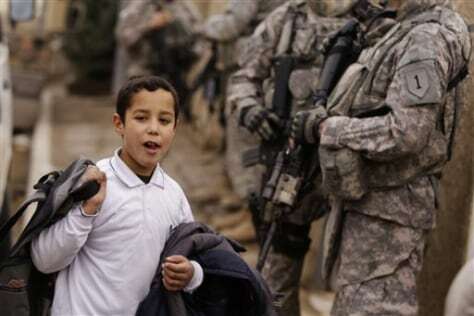 An Iraqi boy on his way home from school walks past U.S. troops on patrol in Baghdad on Tuesday. A new measure passed by the Iraqi parliament will allow non-U.S. military personnel to stay in Iraq until the end of July. The Americans can remain until the end of 2011 under a separate security agreement.